Stuff on Things. Fair Enough. This Photograph from the Vietnam War taken June 8, 1972 shows Kim Phuc, as a 9 year-old-girl running from her home by Trang Bang after it was attacked in a Napalm blast. Photographer Nick Ut captured this moment of terror and immortalized it for the world to see. 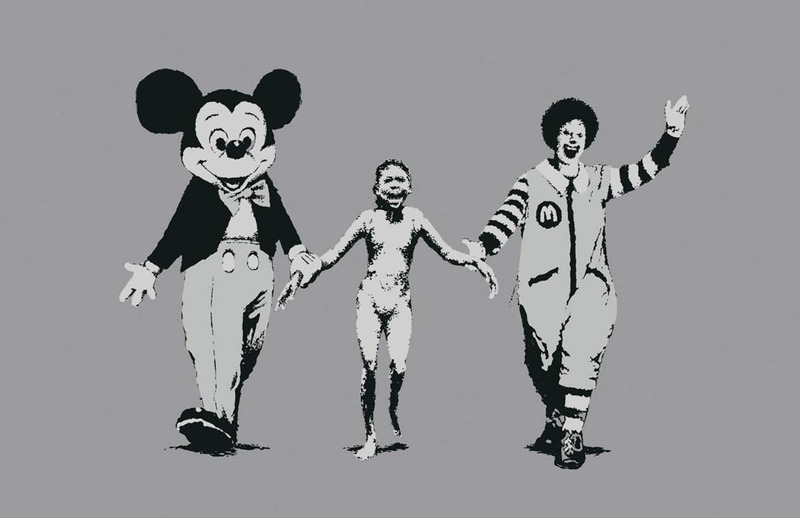 So why did Banksy pick this girl, as the child holding the hands of the 2 most recognizable faces in the world? The two main faces of America in pop-culture? It seems like Banksy, a British street/graffiti artist, is making a comment on the way other cultures look at Americans in respect to how we see ourselves, and the vise-versa of how America sees itself through the eyes of other cultures. The original image itself is printed very large, and with only a warm sepia tone for the design, white as the fill, and grey for the background. It’s great that it is printed large, because that speaks to how the conflict of American consumerism versus the outside world should be viewed. On the large scale. Mickey Mouse and Ronald McDonald almost seem arrogant in their smiles, while this poor girl with burns on her back is screaming, running, trying to get away. It also makes Banksy seem smug in his views on America and our capitalist society. What’s ironic, is that this image has been replicated numerous times for consumption to the masses of American pop culture. Banksys’ work has a following. Not just this image, but much of his work, so it seems funny that prints of this image are for purchase, as well as Banksy Mugs and tote bags. Maybe its just a strange coincidence. That this image shows a big social commentary on the United States treatment of people during not just the Vietnam War, but today with job outsourcing and labor being shipped overseas while all of our products are still made in Eastern Asia. This image was printed at the start of our own economic decline as well. Hmmm…Maybe its just a strange coincidence. The color scheme may or may not have do with just the original photograph being black and white. Banksy chose to alter it only slightly in the mute tone of brown. The fact that its almost monochromatic adds to the drama of the content. If Mickey had those red buttons, or Ronald with that big red afro, shoes, & smile…It wouldn’t be as effective. Color in this instance, would have taken away from the message to be read from his work. There have been prints made since with slight alterations to the color, and you can get them pocket sized for your convenience. Either way, its a strong comment, and something people should look at warily, especially if you have a strong political opinion. Excellent, I thank you. You have helped me on my presentation on Banksy. You made a good point about how ironic it is that he is critiquing consumerism and icons, yet his art becomes up for sale. I think it’s ironic that just because an artist is commenting on capitalism (which is more accurate for this image than consumerism), that they are expected to work for free. Making art is work and artists also have to eat and pay rent. Subject aside. “Another successful defense of society against the culture within itself is to give artists a place by regarding them as the producers of property, thus elevating the value of consuming art, or owning it. It is notable that very large collections of art, and all the worlds major museums, are the work of the very rich or of societies during strongly nationalistic periods. All the principal museums in New York, for example, are associated with the names of the famously rich: Carnegie, Frick, Rockefeller, Guggenheim, Whitney, Morgan, Lehman.